Why do we say that a cat has nine lives? 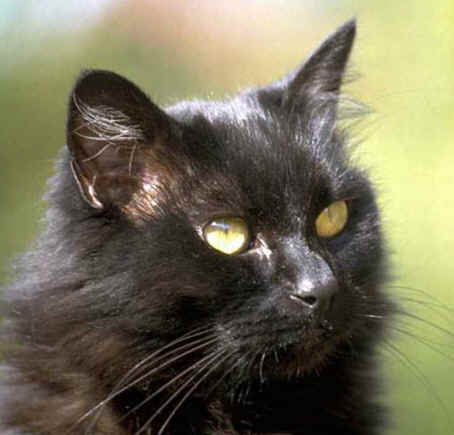 The expression that a cat has nine lives originated in ancient Egypt. There, cats were worshiped as gods and often embalmed and richly buried when they died. Because the major gods of Egypt formed a trinity, three was a sacred number. Most of us have seen a cat’s eyes glowing beside the road at night. The glow is simply a reflection of a car’s headlight. The back of a cat’s eye is lined with a special mirror-like material called “tapetum.” This shiny layer helps the cat to see in dim light by catching even the faintest gleam of light and concentrating it on the retina. Cats often purr when they are happy and contented. In a cat’s voice box, or larynx, are two sets of vocal cords. One set of cords is above the other and each set produces different sounds. The lower are the true vocal cords. The cat uses the true cords to produce the “meow” and the other ordinary sounds it makes. Above these are membranes called the “false” cords. How can a cat see in the dark? Cats can see better in dim light than we can because the pupils of their eyes can open much wider and receive more light than our eyes can. You may have heard that cats can see in the dark because they have special kinds of eyes. It is true that cats can see much better than we do in dim light. But cats cannot really see in total darkness. In bright sunlight, the pupils of cat ’s eyes become narrow slits that shut out much of the glare. At night, they widen to great circles, almost as large as the entire eye to let all the light there is. Inside a cat’s eye is a special mirror like material that helps make the eye extra-sensitive to light by collecting the dim rays of light and reflecting them back to the retina, where the act of seeing begins. When you see a cat’s eyes glowing beside the road at night, it is because the mirror like material is reflecting the light from your flashlight or the headlights of a car.